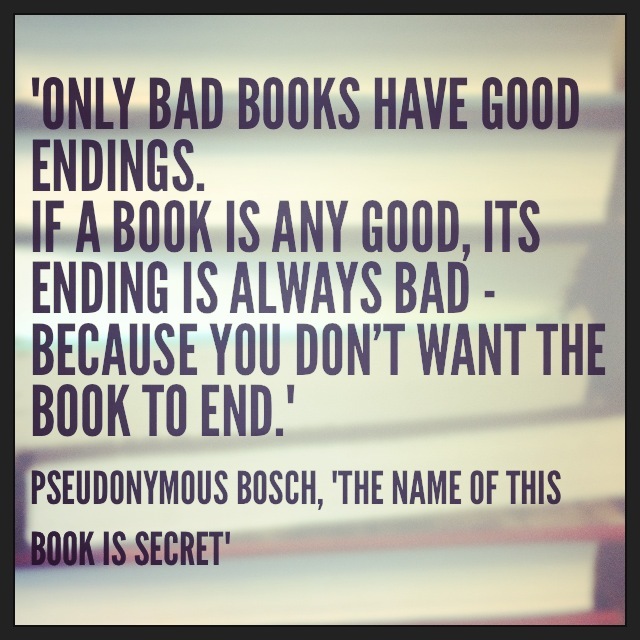 Book Quote of the Day: Can a Good Book Have a Good Ending? Admittedly, I have not read the critically acclaimed and bestselling “Secret” mystery series by Pseudonymous Bosch, though the second novel holds a place on my bookshelves. But I stumbled on this lovely articulation of the reader’s dilemma in my web travels. These words took me back to reading Haruki Murakami’s “1Q84.” The prospect of reaching the end of a good book just about always leads to mixed feelings—I want to find out what happens to the characters, but I don’t want to say goodbye to them. But with “1Q84,” these conflicting desires felt especially acute. Maybe it’s because of how eagerly I had been anticipating the U.S. release of the novel. Or perhaps because it was so long, it allowed me to connect with the characters more deeply. Or it could be the dreamy worlds Murakami (and his translators) paint through words. Even when the content is frightening, tense, or just plain terrifying, the rhythmic quality of the writing feels paradoxically soothing. Whatever the cause(s), the closer I neared to the end of the story, the more slowly I read, wishing to forestall the inevitable goodbye, my desire to remain in Murakami’s world outweighing my desire to find out what would happen to the protagonists, Aomame and Tengo. But only up to a point: I did eventually finish the novel. What books have you not wanted to end?